Stellaria media chickweed, also known as the chickenwort and winterweed is an annual flowering plant in the carnation family Caryophyllaceae. The plant is native to Europe and Asia, and is now found throughout the world. It is used as a cooling herbal remedy, and grown as a vegetable crop and ground cover for both human consumption and poultry. It is occasionally called common chickweed to differentiate it from other plants called chickweed. Other popular common names of the plant are Common chickweed, Starwort, Stitchwort, common starwort, nodding chickweed, star chickweed, starwort chickweed, satin-flower, Chickweed starwort, chickenwort, craches, maruns, winterweed, mouse ear, tongue grass, Adder’s mouth, alsine, chick wittles, chickenmeat, clucken wort, hashishat al qazzaz, passerina, sercedili, skirt buttons, starweed, tongue grass, vogelmuur and white bird’s wye. The plant is commonly called the “snow in the summer” because of its small white star-shaped flowers that usually bloom in the spring and last until autumn. The genus name Stellaria refers to chickweed’s tiny, white, star-shaped flowers. The common name refers to the herb’s appeal to birds and barnyard fowl, particularly young chickens. Most people considered it as a troublesome weed. The fact is that is plant is actually a useful herb we can take advantage of. The leaves and flowers open up fully when good weather is approaching. Likewise the leaves and flowers fold up shut when rain is on its way. 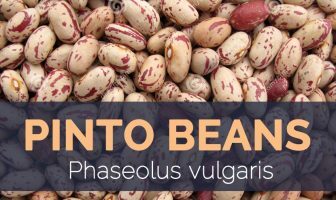 Over time, it also became naturalized in North America and can be found in recipes and cultural specialties around the world. For those who worry about the safety of chickweed, it is completely safe to consume in moderation. While it is not the most popular leafy addition to a salad, this plant has a pleasant taste and has a slightly different growing season. Chickweed is a prolific, low growing, annual, winter annual or sometimes perennial herb that grows about 15 cm (6 in) tall, sometimes up to 40 cm (15 in). The plant is found growing in woodland areas prone to flooding, thickets, cropland and fallow fields, lawns and gardens, nursery plots, cultivated fields, pastures, gardens, shady lawns, roadsides, wasteland, areas adjacent to buildings, and miscellaneous waste areas. The plant grows on a very wide range of substrates, but prefers moist, fertile soils with a neutral pH and good aeration. The plant has fibrous, shallow root system. Stem is much branched, erect or ascending from a creeping base, rather weak, minutely pubescent in longitudinal lines bearing a single row of hairs on alternating sides of successive nodes, 20 to 80 cm long trailing on the ground, juicy, pale green and slightly swollen at the joints. Leaves are opposite, simple, succulent, egg-shaped very variable in size in different plants, smooth, or fringed with hairs near the base, ovate-elliptic, acute or shortly acuminate, 6 to 30 mm long, 3 to 15 mm wide; petiole of lower leaves 5 to 20 mm long and having a line of hairs, petioles of the highest leaf often very short or sessile. 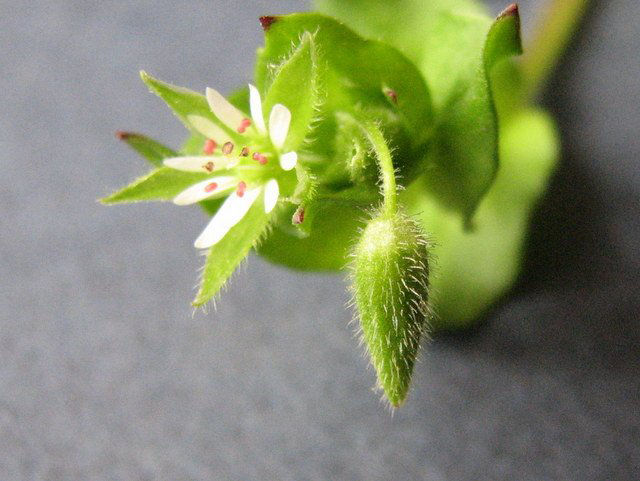 Chickweed flowers are small, white, and are held tightly in the upper leaf axils. They open into loose branching clusters with age on ½ inch hairy stalks. Each flower is about 1 cm across with 5 deeply notched white petals, usually with ten stamens with light yellow to greenish or even reddish anthers and a round green ovary in the center with 5 filament-like styles at the top. The five sepals are about as long as the petals, lanced shaped with fine, spreading hairs on the outer surface. 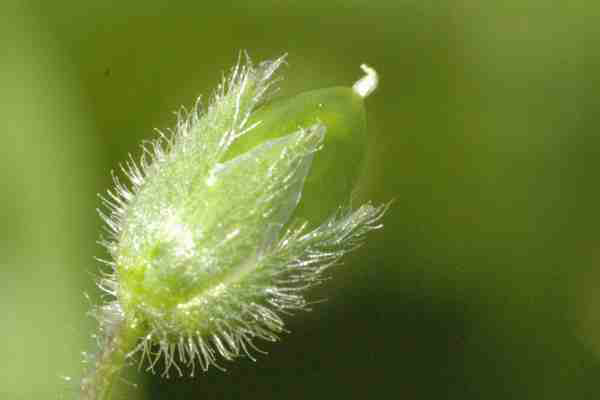 Flower stalks are also slightly hairy; at flowering time they are erect to ascending and longer than the sepals, spreading more when fruiting. They open about nine o’clock in the morning and are said to remain open just twelve hours in bright weather, but rain prevents them expanding, and after a heavy shower they become pendent instead of having their faces turned up towards the sun, though in the course of a few days rise again. Flowers are followed by many seeded dry capsule, ovoid, usually a little longer than the sepals, opening by six teeth, breaking into five segments at maturity. 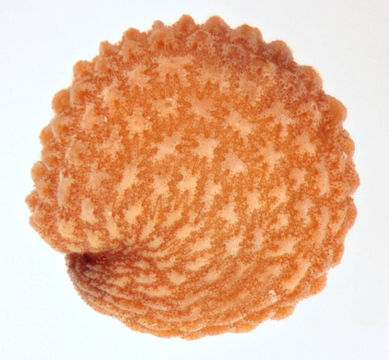 Seeds are dark brown, yellowish or dull reddish-brown, nearly circular, slightly elongated toward the notch at the scar, about 1 mm across, the surface covered with conspicuous curved rows of irregular wart-like projections, marginal projections are more prominent and toothed in appearance. Applying poultices or compresses of this herb to wounds encourages circulation and blood flow while protecting against infections, which speeds the healing process. Chickweed is traditionally consumed to soothe the consumption in the human body. Constipation is mainly due to the insufficient bowel movement. The goodness is due to the ample amount of the fiber innate. The goodness of the beta-carotene innate in the chickweed is helpful in obtaining the normal vision. Beta-carotene is the source of the vitamin A, which is vital to obtain the healthy vision. The presence of the saponin in the chickweed is beneficial in the removal of the mucus from the respiratory tract. This produces good effects on the human body. Joint pain is due to the inflammation of the skin and the use of the chickweed with the anti-inflammatory property is helpful in the soothing of the wound. When used as a febrifuge, chickweed can help to bring down a fever. It is really important to know the cause of a fever before attempted to bring down the body temperature. Fever is a natural response to infection or illness. Many illnesses increase at normal body temperature, and a fever is a good indication that the immune system is functioning to ward off the infection. In fact, a fever is a good sign as it means that the body is responding to fight the infection. A fever can become dangerous when it reaches 105°F. Speak with a trained health professional as to when you should seek medical help when fever strikes. 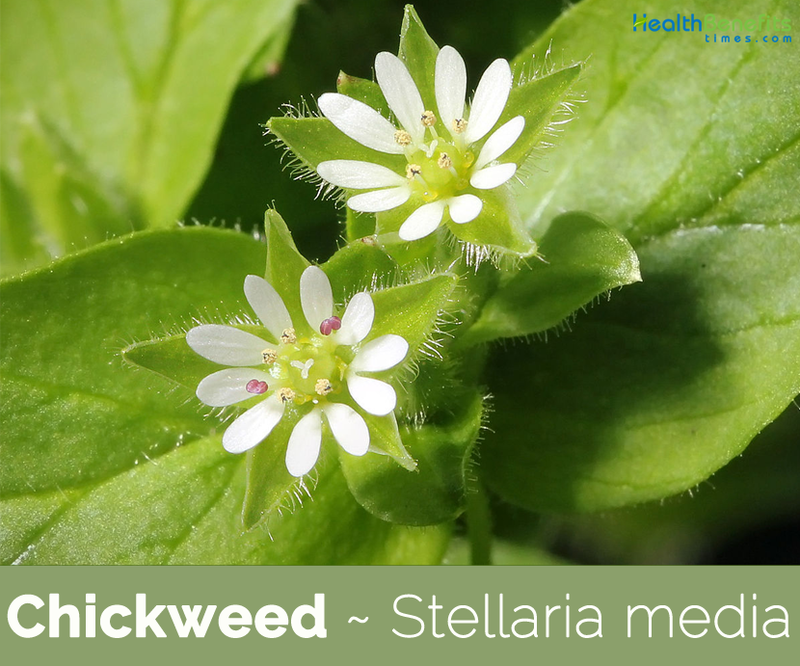 Chickweed has a very long history of herbal use, being particularly beneficial in the external treatment of any kind of itching skin condition. It has been known to soothe severe itchiness even where all other remedies have failed. Whole plant is astringent, carminative, demulcent, diuretic, expectorant, laxative, and refrigerant, vulnerary. Taken internally it is useful in the treatment of chest complaints and in small quantities it also aids digestion. An infusion of the fresh or dried herb can be added to the bath water and its emollient property will help to reduce inflammation – in rheumatic joints for example – and encourage tissue repair. Decoction of the whole plant is taken internally as a post-partum depurative, emenagogue, galactogogue and circulatory tonic. It is also supposed to relieve constipation and be beneficial in the treatment of kidney complaints. Decoction is also used externally to treat rheumatic pains, wounds and ulcers. Expressed juice of the plant has been used as eyewash. Fresh leaves have been used as a poultice for inflammation and indolent ulcers with most beneficial results. Poultice of Chickweed enclosed in muslin is a sure remedy for a carbuncle or an external abscess. 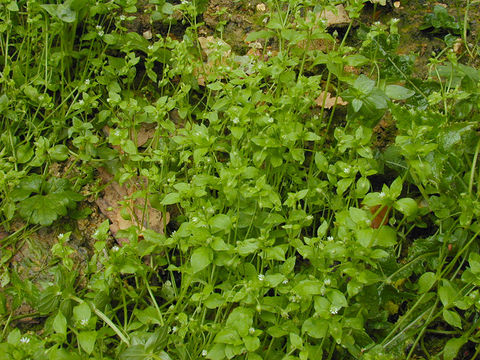 Water in which the Chickweed is boiled should also be used to bathe the affected part. Decoction made with the fresh plant is good for constipation. 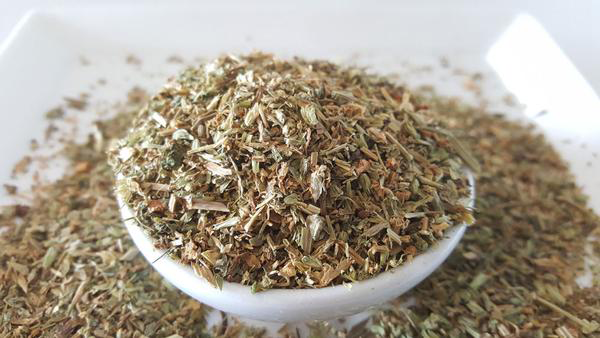 An infusion of the dried herb is effective in coughs and hoarseness. It has been used as a remedy to treat itchy skin conditions and pulmonary diseases. 17th century herbalist John Gerard recommended it as a remedy for mange. Modern herbalists mainly recommend it for skin diseases, and also for bronchitis, rheumatic pains, arthritis and period pain. 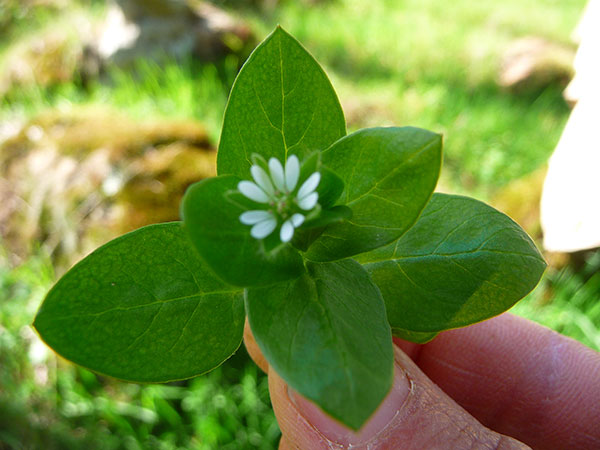 Poultice of chickweed can be applied to cuts, burns and bruises. Chickweed is used as herbal treatment for Skin problems like Roseola, Eczema, and Psoriasis. It reduces itching and irritation. It is beneficial if you have dried or chapped Skin and Bug Bites. It is useful in healing Acne and red pimples. 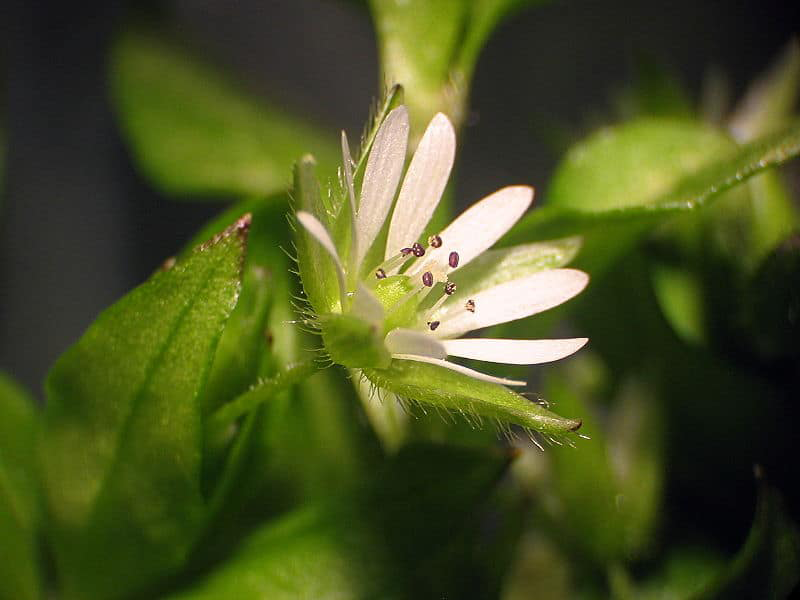 External use of Chickweed is very effective for the treatment of Sores, Boils, and Burns. Chickweed soothes swelling on the Skin. Anti-inflammatory properties of Chickweed reduce Internal and External inflammation. It helps in treating Scurvy (Bleeding Gums). It is a natural pain killer and is helpful in treating Muscle and Joint pains. 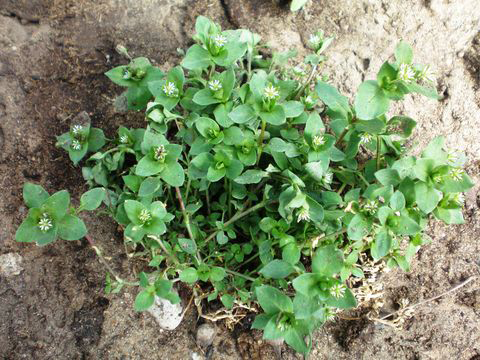 Consumption of Chickweed eases the Stomach and Intestinal problems. Tea made of Chickweed helps clean the Intestines and the Kidneys by removing toxic waste from the body. It is also used for treating the Urinary Tract Infections and Cystitis. It helps in restraining Respiratory problems and reduces Phlegm in the lungs. It acts as a tonic for Lung congestion, Flu, Bronchitis and treats Asthma. 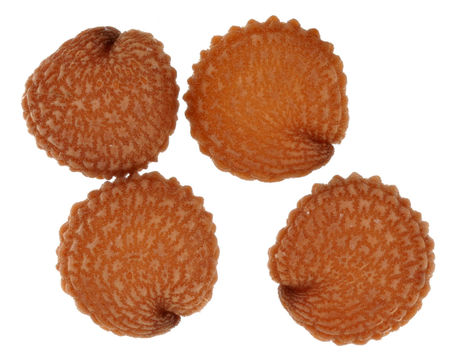 It is helpful in treating obesity and lowers down the Cholesterol level in the body. Decoction has been used in traditional herbal medicine to treat cystitis and other related urinary tract inflammations. Decoction of the fresh aerial parts is a traditional treatment for relief from extreme physical fatigue and debilitation. Use the ointment applied on a bandage to help draw splinters. 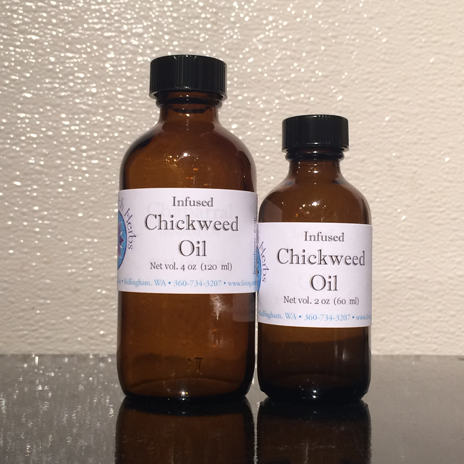 Urinary Tract Infections: Have 20-30 drops of Chickweed tincture daily for 3 months. 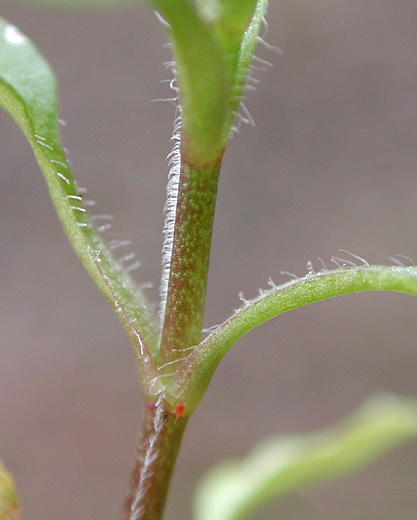 Erysipelas: Prepare a poultice of the leaves of Chickweed. Apply on the affected area. Urticaria: Take chickweed in a powder form. Prepare a paste. Apply it over the affected area. Obesity: Drink Chickweed ( Buch Bucha ) tea regularly. It is an old remedy to cure Obesity. Blurred Eyes: Take the leaves and the Flowers of Chickweed, Barberry, Marigold, Goldenseal, Oregon Grape, Eyebright, Cornflowers. Prepare an infusion. Let it cool. Use as an eyewash, 2-3 times a day. Infused Oil: If you infuse oil with chickweed leaves and allows them to soak overnight, you can then use this oil for topical applications on the body, or you can add it to your bath, which can relieve skin conditions and inflammation. 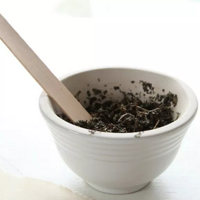 Tea: Many people choose to brew a delicious, earthy tea from this herb’s leaves, mostly because this appears to have notable weight loss properties, thanks to the laxative and diuretic abilities of this herb. 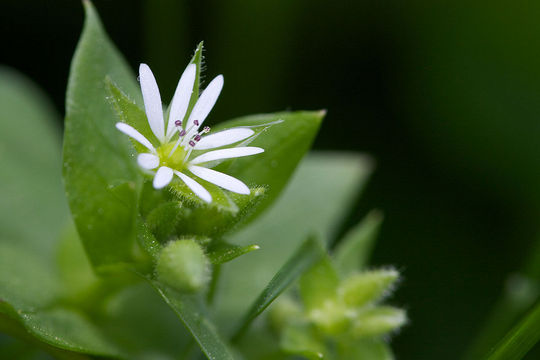 Compress: If you make a decoction of chickweed leaves, you can soak a compress in the mixture and apply it directly to wounds, inflamed areas, or parts of the skin that require treatment. Poultice: You can crush the leaves of the chickweed plant into a light paste and topically apply it to acute injuries and wounds to speed the healing process. Salad Vegetable: Perhaps the most popular use of this plant, you can add a handful of these leaves, flowers and the top part of the plant to your salad for a unique flavorful bite and a number of excellent internal health benefits. The stems, however, are less palatable to eat as a raw vegetable. 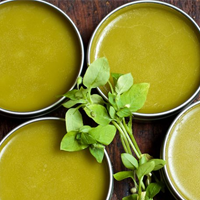 Smoothies and Raw soups: Chickweed is a perfect addition to green smoothies or can be mixed up with any fruit to create a refreshing frothy drink. 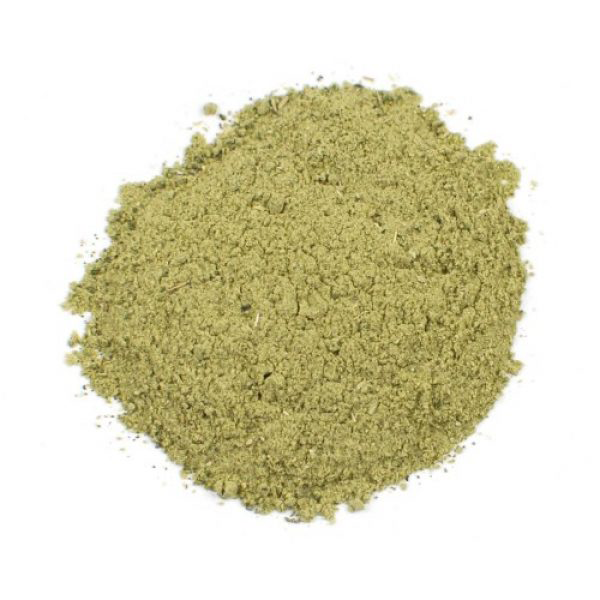 As a saponins-rich wild edible, when blended it froths up similar to the consistency of eggs in the traditional American drink called the “Orange Julius.” It can be used with other citrus fruits or pineapple to create the same effect. A small handful is perfect for any raw soup recipe, blended up with spices, miso and avocado for wild soup meal. 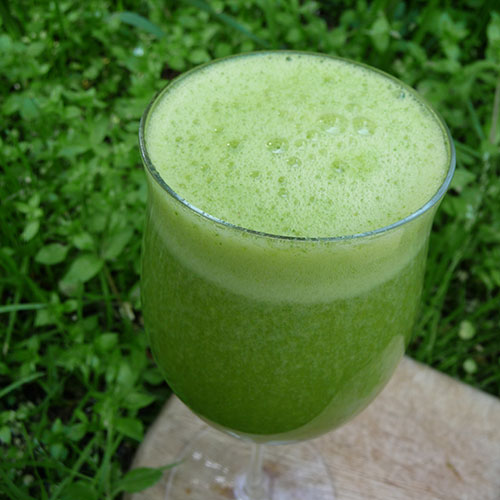 Juice: Chickweed is also an excellent ingredient in juicing recipes when juicing other greens, fruits and vegetables. It is a great herb to use when juice fasting to help clean the lymph and detox the body. The fresh pressed juice is maybe the most beneficial way to consume this wild edible. Lightly steamed: Chickweed can be chopped and steamed with a taste similar to spinach. It can be used in much the same way you would use any leafy green, but it loses a good portion of its nutritional value when cooked over several minutes. 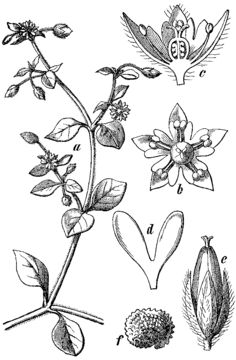 Chickweed extracts: Tinctured extracts of the plant are also available or you can make your own using an alcohol menstruum. Young leaves raw or cooked are used as a potherb. They can be added to salads whilst the cooked leaves can scarcely be distinguished from spring spinach. Seeds are ground into a powder and used in making bread or to thicken soups. Leaves may also be used uncooked with young Dandelion leaves to form a salad. Taken as a tea, pour one cup of boiling water over two teaspoonful of the dried herb and steep for 5 minutes; do not allow the herb to boil. Remove water from heat and pour into a cup. Add chickweed to the cup. Strain chickweed out and drink tea while hot. In a cup, place the fresh chickweed. Pour boiling water over the herb. Let the mixture infuse for 15-20 minutes. Strain the mixture and drink the tea hot. 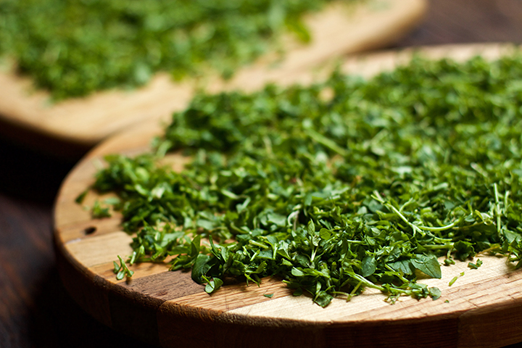 Take the herbs you have chosen and chop them into small pieces on a cutting board. Transfer the herbs to a mortar and pestle, and crush the chopped herbs until they become a pulp. The end result needn’t be silky smooth – the main thing is to start the juices flowing. As you chop and mash, the herbs will release their natural juices and the leaves will become softer. Herbs may also be chopped using a blender instead of a cutting board and mortar and pestle. Spread the crushed herbs onto the desired area of the skin. Take desired dried herbs and combine with just enough hot water to moisten them. For roots, it’s best to use a powdered form. Simply add hot or cold water a little at a time to create a thick paste. Spread the paste evenly over the desired area. Wrap with gauze or muslin. Finely chop the fresh chickweed and arrange on a cutting board or cookie sheet. Allow the chopped chickweed to wilt for 12 to 24 hours. Measure out 1 1/4 cups of coconut oil. Add the wilted chickweed to the oil. To acquire the best quality of oil, there should be an equal amount of chickweed and oil in the mixture. Use a blender to mix the chickweed and the coconut oil together. It typically takes 15 to 20 seconds before the two ingredients are fully blended together. You can also use a food processor for this step. Place the mixture on top of a double boiler or improvise by placing a bowl on top of a pan that has about 2 inches of water in it. Bring the water to a boil and then reduce to a simmer. Stir the oil occasionally until the oil is warm to the touch. Allow the mixture to sit for a few hours. Repeat step 4 for about four times to ensure that the plant material fully seeps into the coconut oil. 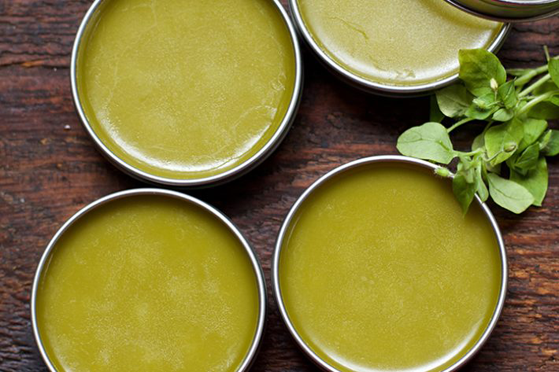 Be sure that you don’t get the oil too hot to avoid the leaves from becoming “crispy.” You’ll know that the oil is ready when it has taken a green hue. Strain the mixture after 24 or 48 hours to remove the leaves from the oil. Chop the fresh chickweed finely and arrange it into a thin layer on a cutting board or cookie sheet. Allow to wilt for 12-24 hours. Measure out 1 1/4 cup olive oil in a measuring cup. Add the wilted chickweed to the olive oil. Place the chickweed and olive oil in a blender or food processor. Blend for 15-20 seconds or until the chickweed and olive oil are well blended. Bring the water to a boil and then reduce to simmer. Stir the oil occasionally and continue until the oil is quite warm to the touch. Turn off the heat and allow the mixture to sit for several hours. Measure out 1 cup of the infused oil. Measure your beeswax by weight. Using a double boiler or in a pan on very low heat, melt the beeswax. In excess doses chickweed can cause diarrhea and vomiting. Some people are allergic to chickweed, particularly if they are related to other plants in the daisy family. This can result in itching, rashes or redness on the skin, and if consumed, could result in gastrointestinal distress and nausea. Alsine apetala Kit. Ex Nym. Stellaria alsine Afzel. & Wadsb. Stellaria apetala Opiz ex Nym. Stellaria media subsp. media (L.) Vill. Stellaria media var. brauniana Engl. Stellaria media var. gymnocalyx Trautv. Stellaria media var. microbattle Batt. Stellaria media var. microbattle Batt. ex Beg. Stellaria media var. Normag Speg. Stellaria media var. proceed Klett & Richt. Stellaria media var. transiens Bég. 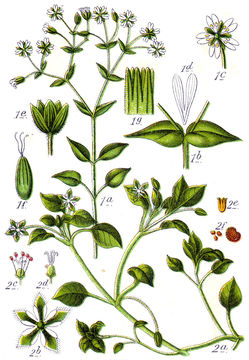 Stellaria murmuria Buch.-Ham. Former Wall. Stellaria pallida Dum. ex Nym. Stellaria umbrosa Opiz & Rupr.